Yerba mate is referred to as "the drink of the gods" in South America, and with good reason. This delicious beverage provides a caffeine kick without the jitters, making it a favorite for recovering coffee addicts and those burning the midnight oil. Looking for the ideal introduction to yerba mate? Start with our best-selling Good Morning Mate or with a wide assortment in our ever-popular Yerba Mate Sampler. Switching from flavored lattes to tea? Go for our latte-friendly mates, like Roasted Pumpkin Yerba Mate, Roasted Cocoa Yerba Mate, Cocoa Raspberry Yerba Mate or Caramel Cream Yerba Mate. Want a lot of spice in your brew? 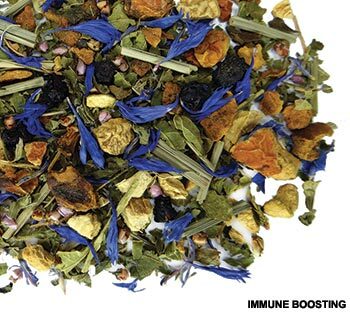 First things first, check out our masculine, pungent Chai Spice Yerba Mate. Looking for something unusual and delightful? Try our high-caf, South American Amazon Spice Guayusa or our culinary-inspired Pistachio Lime Yerba Mate. Prefer your mate pure? Our unblended Roasted Yerba Mate and Green Yerba Mate are just what you need! How do I pronounce yerba mate? Yerba mate hails from subtropical South America. The yerba mate plant is a small tree from the Holly family. Most yerba mate is grown in Argentina, Brazil and Paraguay. It was introduced to the world by the Guarani Indians. They consider it to be not just healthy for the body, but healthy for the soul. For centuries, this herbal tea was sipped from a gourd and offered as a symbol of hospitality as it was passed hand to hand around a circle of friends. The tradition of friends sipping from the gourd is the reason this tea got its meaning "herb cup." For centuries, the Ache Guayaki Tribe drank yerba mate because of its rejuvenating effects and the enhanced focus and nourishment it provides. In recent years, yerba mate has become increasingly popular with world-class athletes and health-conscious individuals. It has now gained the attention of many people who want to live a healthy lifestyle. How do I brew yerba mate? Brewing yerba mate is pretty straightforward. Just brew about 1 - 1.5 Tablespoons of dry leaf per cup with near boiling water for three to seven minutes, depending on your taste preferences. Add sweetener if desired (we love it with a little honey) and enjoy, or chill it and serve over ice. Some people like to add a little milk (or milk alternative) or lemon juice (or other citrus juice), which can taste great with certain blends. And some people like to make a yerba mate latte with foamed milk (or milk alternative) and sweetener. These are also great ways to enjoy mate tea! Before yerba mate can be processed, it has to be grown. It takes at least two years for the tree to mature enough to be harvested. After it's harvested, mate can be processed in one of two ways: drying or roasting. Yerba mate that is only dried is known as 'green mate' because of its green color. It has a more astringent, green flavor and it is far less common than roasted yerba mate. Roasted yerba mate is harvested, dried, aged and roasted, which gives it a deeper, earthier flavor. It is sometimes dried with smoke, which gives it a roasty, smoky flavor that coffee drinkers love. Weight Loss -Yerba mate raises metabolism, suppresses appetite, and helps the body burn calories through its 'thermogenic' effect. Stimulation - It can help eliminate fatigue, while stimulating mental and physical activity. If has a beneficial effect on nerves and muscles; it can also enhance intellectual work. Nutrition - . It contains vitamins A, C, E, B1 , B2, Niacin (B3), B5, B ... and complex minerals like Calcium, Manganese, Iron , Selenium, Potassium, Magnesium, Phosphorus, and Zinc. It also contains Carotene, Fatty Acids, Chlorophyll. Flavonols, Polyphenols. Inositol. Trace Minerals, Antioxidants, Tannins, Pantothenic Acid, and 15 Amino Acids. pH Balance - It is alkalizing. not acid. Research shows that most bacteria and cancer cells cannot grow in an alkaline environment. Immunity - Yerba Mate also contains saponins which are natural plant sources that have been found to stimulate the immune system and aid the body in protecting against disease. Antioxidants - It contains polyphenols which are a group of phytochemicals that act as powerful antioxidants and are considered to have anti-cancer effects in mammals by strengthening their natural defenses. Digestion - It has been found that drinking this tea can help benefit individuals who suffer from gastrointestinal problems. Researcher also shows that drinking this tea on a regular basis may help to induce and increase bile flow and help with intestinal transit. Oral Hygiene - Researchers discovered that drinking this tea on a regular basis may help to eliminate bad breath. It has been shown that this tea helps to eliminate both the growth of bacteria that causes bad breath, and other bacteria producing odorous compounds. Consumed (and grown) for centuries in South America rain forests, the yerba mate phenomenon has now reached the Northern Hemisphere. Take part in this old tradition and drink not only for your health but share it with others.